I went to a frozen yogurt shop, named “llaollao”, on wednesday. The shop is the first franchise shop in Japan from this Spanish company. The location is in Umeda, Osaka. There are 3 cup sizes and customers can choose toppings from a variety of seasonal fruits, sauces and cereals. I ordered a small cup with caramelized sunflower seeds. Although, the appearance was plain, the taste was refreshing and very delicious. I ate all at once because it was so good and there was no chair in the shop. This tiny shop is actually a standing frozen yogurt bar. I kept the green spoon. Every frozen yogurt comes a long, green stylish spoon. After I finished mine, I kept the spoon with me. I couldn’t throw away such a cute spoon. 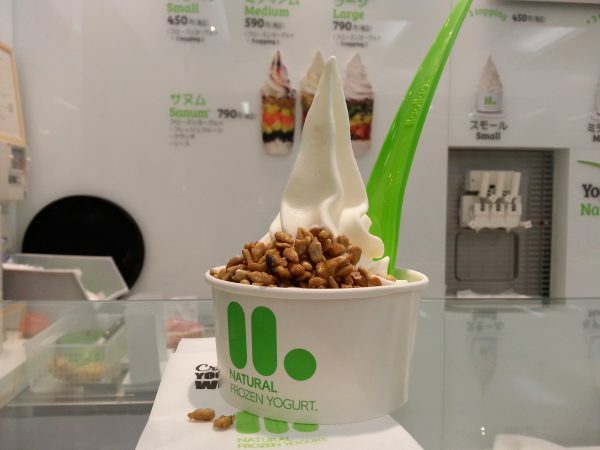 If this shop is successful, llaollao may open more shops in Japan. Maybe one of them will be at your town!